Winchester Cathedral - one of the finest medieval cathedrals in Europe, founded in 1072 and home to the 12th century Winchester Bible. The school retains close links with the cathedral, where William of Wykeham lies buried in a splendid chantry chapel. The Great Hall – the last remaining part of Winchester Castle, built in the 13th century, and containing a significant symbol of medieval mythology, King Arthur’s Round Table. The ruins of Wolvesey Palace - originally one of the greatest medieval buildings in England and the palace of the bishops of Winchester. The modern Bishop’s Palace, designed by Sir Christopher Wren, is next door. Winchester has contributed greatly to the literary heritage of our country. Below are some of the figures associated with the city and with the school itself. The Archive and the Fellows’ Library contain many manuscripts and first editions by these and other authors, which boys are able to use in Div and for extended projects. A short drive from Winchester is the village of Chawton where Jane Austen wrote many of her novels, including Emma and Sense and Sensibility. Austen moved to Winchester when her health deteriorated and she died at 8 College Street, in a house now owned by the school. The school educated several members of her family, and so the Fellows’ Library owns several minor Austen manuscripts. Keats stayed in Winchester in 1819, his most productive year as a poet: “The air is worth sixpence a pint” he told a friend. He took regular walks in the water meadows, and wrote his “Ode to Autumn” after walking along the river to the Hospital of St Cross. The city of Winchester has had a tremendous impact on the development of the English language. From this, his capital, King Alfred the Great proposed that primary education should be in English rather than Latin. John Harmar, better known as Warden Harmar, was one of the translators of the 1611 Authorised Version of the Bible. In the 18th century, Bishop Robert Lowth who also translated the bible, wrote one of the most influential textbooks of the English language, A Short Introduction to English Grammar. Bishop Thomas Ken, who carved his name in the Cloister while still a pupil here, is perhaps the first Winchester author to win national acclaim for his verse. He became chaplain to Princess Mary, the wife of William of Orange. On returning to Winchester as a cathedral canon, he refused to host Nell Gwynne. He published his Manual of Prayers for the use of the Scholars of Winchester College in 1674, much reprinted, and containing what are now several of the best-known hymns and prayers in the language. Related to Bishop Ken through marriage was Isaak Walton, author of The Compleat Angler, a celebration of the art and spirit of fishing. Walton died at his daughter’s house in Winchester. In the 1800s, Winchester College produced the talents of Thomas Otway the dramatist, Sir Thomas Browne, an important prose stylist, as well as the poets William Somerville, who write the Georgic poem The Chace, and Edward Young, best remembered for Night Thoughts, much lauded by Samuel Johnson and Samuel Richardson. William Whitehead, an Old Wykehamist who wrote tragedies, satires and sentimental comedies, became poet laureate. The poet William Collins was perhaps even more influential: his lyrical odes mark a turn away from the Augustan style of poetry towards a more Romantic sensibility. The poet and literary critic, Joseph Warton not only attended Winchester but became its headmaster from 1766 to 1793. There is a magnificent memorial to him in the Cathedral. Joseph’s older brother, Thomas Warton, was a literary historian, critic and poet, and from 1785 to 1790 was Winchester’s second poet laureate. Some critics credit Thomas with the invention of the literary term "romantic." Winchester also produced the poet, Thomas Burgess, and the influential sonneteer William Lisle Bowles. Coleridge idolised Bowles as his favourite poet and was much influenced him: “surely never was a Writer so equal in excellence” he explained. Arguably, Winchester's literary significance was at its greatest in the Victorian period. Thomas Arnold, an Isle of Wight boy who won a scholarship to the College, went on to become headmaster of Rugby and Professor of History at Oxford. He was a prodigious and influential author, as well as being the headmaster in Tom Brown's Schooldays, and the father of the poet and literary critic Matthew Arnold. An accident in a chemistry lesson led to a rather touching letter from Matthew to his father preserved in the college archive, but it did not prevent Matthew from going on to become an eminent poet (Dover Beach, the Scholar Gypsy) and, in such works as Culture and Anarchy, one of our foremost cultural critics. A near contemporary was the prolific novelist Anthony Trollope - he too left his signature carved in the college brickwork. One of his most famous novels, The Warden, is based on controversial reforms at the mediaeval hospital of St Cross, just down the river from the College. Author of The Heir of Redclyffe (1853) and described as the ‘novelist of the Oxford Movement", Yonge was born and lived in nearby Otterbourne. Widely respected in the 19th Century, her abundant work is mostly out of print these days. Theologian and, for a time, Professor of Poetry at Oxford, Keble’s most famous work was The Christian Year, a book of poems for the Sundays and feast days of the church year, which has been acknowledged as the most popular volume of verse in the 19th Century. 95 editions were printed during Keble's lifetime, and at the end of the year following his death, the number had arisen to 109. Much later in the Victorian century the College was attended by a contrasting figure, the future companion of Oscar Wilde, and a poet in his own right. A magazine he started at Oxford, The Spirit Lamp, is the inspiration for a publication of the same title, thriving at Winchester today. The First World War saw a new generation of Winchester poets such as Robert Nichols, Herbert Asquith, Edward Wyndham Tennant, AP Herbert, and the renowned translator of Proust, Charles Scott Moncrieff. Later in the Twentieth Century, Winchester produced novelists such as Lieutenant Commander Nicholas Monsarrat, author of The Cruel Sea, Patrick Gale and Ned Beauman. The school also educated Joss Whedon, screenwriter and producer of many Marvel films as well as the creator of Buffy the Vampire Slayer. Notable 20th-century poets include Sir William Empson, also an eminent literary critic (and whose name is honoured by our English society), and Michael Hofmann. One of our former Heads of English is the Faber poet, Lachlann Mackinnon, whose partner is the poet Wendy Cope. 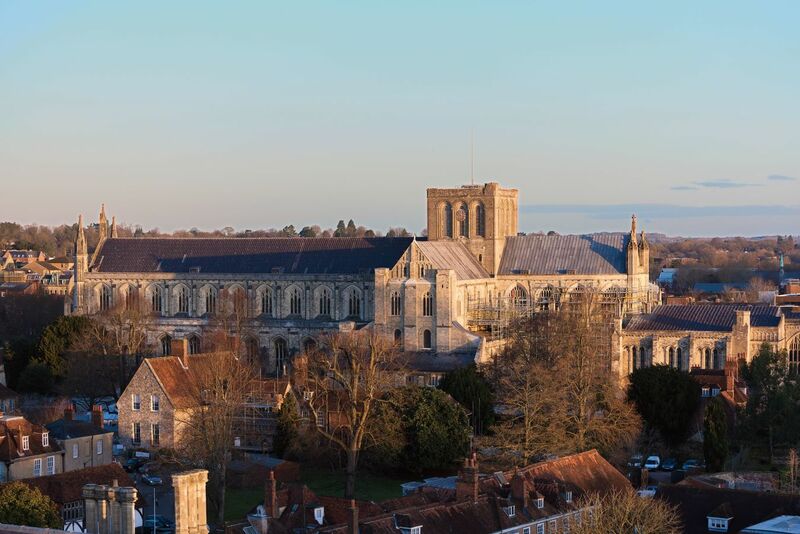 Winchester has also been the setting for novels by literary giants such as Thomas Hardy and Elisabeth Gaskell as well as more recent popular novelists such as Ken Follett and David Nichols.